The war may have been a global conflict, but in the mind of the public, then and now, it would be inextricably associated with the trenches of the Western Front. 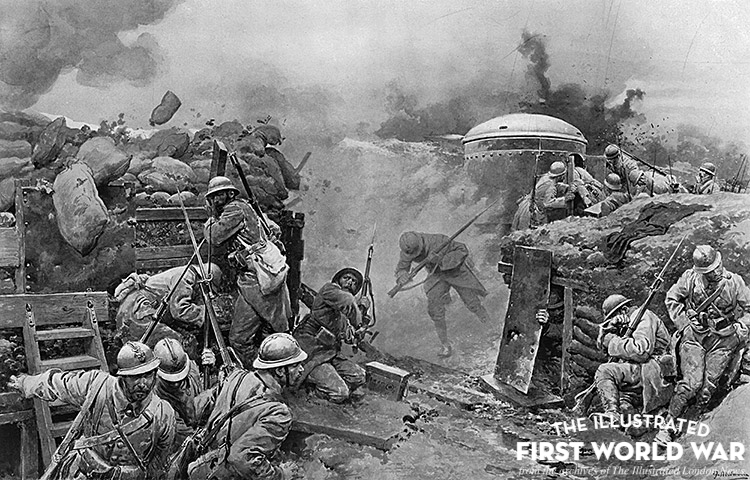 The old style of mobile warfare effectively ended with the 1st Battle of Ypres in October/November 1914 when both sides hastily dug themselves into the boggy Ypres earth. So began a line of trenches that would soon run from the North Sea to the Swiss border and remain in place for the next four years, during which time five million soldiers from both sides would experience life in them. One “eyewitness” account of trench life was published in The Graphic in January 1915 and described it as “a strange, cramped existence, with death always near, either by means of some missile from above or some mine explosion from beneath; a life which has one dull, monotonous background of mud and water”. A cycle of duty required battalions to serve in the fire (front) trench for seven days, then a further week in the support trenches, followed by the relief of a week off. Though the horror of “going over the top” cannot be denied; many described serving in the war as “90% routine and 10% terror”. Aside from major offensives, death could strike at any time while serving in the front line – from sniper, shellfire or gas – while it is almost impossible to calculate the number of men who suffered psychological damage caused by the sound and proximity of constant bombardments. who hunted them down, but never quite vanquished them completely. Existing in such conditions meant that any distraction to alleviate the boredom and difficulties were especially welcome. Letters conveyed love from home, while parcels might contain soap, knitted garments, illustrated magazines, fruit cake, chocolate or, best of all, cigarettes and tobacco.